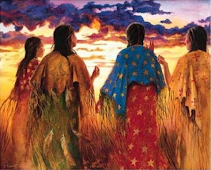 SHAWL Society is a grassroots advocacy group, based on the Spokane Indian Reservation in Eastern Washington. The major focus of this effort involves developing community education and strategies to address impacts of radiation exposure due to 50 plus years of uranium mining and milling on this reservation. The federal government has reached an agreement with one of the world's largest mining companies on a $193 million cleanup of a defunct uranium mine on the Spokane Indian Reservation. Superfund officials for the federal government and the Spokane Tribe check the water level of Pit 3 at the inactive Midnite Mine in this file photo from 2003. The mine opened in the 1950s to produce uranium for the U.S.-Soviet arms race and closed in 1981. SPOKANE — The federal government has reached an agreement with one of the world's largest mining companies on a $193 million cleanup of a defunct uranium mine on the Spokane Indian Reservation. Newmont Mining Co. and its subsidiary, Dawn Mining, will pay for the majority of the restoration costs at the Midnite Mine. 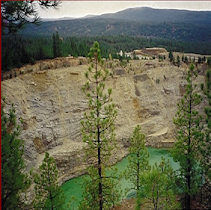 The U.S. Department of the Interior will contribute $42 million to future cleanup activities for failing to fulfill federal trust responsibilities to the Spokane Tribe through proper oversight of the open-pit mine. The Midnite Mine opened in the 1950s to produce uranium for the U.S.-Soviet arms race. Although it closed 30 years ago, members of the tribe remain concerned about the Midnite Mine's ongoing effect on their health and the environment. About 33 million tons of radioactive waste rock and ore remain at the 350-acre site above the Spokane River. "Today signals a huge milestone in addressing what really is a blight on the landscape in the heart of the Spokane Reservation — not just from a physical standpoint, but from the environmental consequences of the operations there," said Dan Opalski, the Environmental Protection Agency's Superfund director in Seattle. The proposed consent decree was filed in U.S. District Court on Friday. It's subject to a 30-day public-comment period. If the court approves the decree, the agreement would end years of litigation and kick off two to three years of design work for the Midnite Mine's cleanup. The restoration work itself would require about seven years of construction activity. "To this day, we don't know all the negative impacts of what that mine did to the land, the animals and the people," Rudy Peone, a tribal council member, said in an interview last spring. In court documents, the Spokane Tribe has emphasized the land is part of its traditional homeland. The Blue Creek drainage where the mine is located was once used for hunting, fishing and gathering traditional foods, including roots and berries. But two years ago, the federal Agency for Toxic Substances and Disease Registry cautioned tribal members against eating wild game, fish or plants gathered from the drainage, which is a tributary to the Spokane River. The foods could be contaminated with heavy metals or radiation, the agency's report said. The Spokane Tribe's offices were closed on Friday, and officials could not be reached for comment on the cleanup agreement. An official for Dawn Mining Co. also couldn't be reached. The Midnite Mine dates to the Cold War era. In 1954, two members of the Spokane Tribe discovered uranium on the reservation. The federal government was offering lucrative contracts at the time to spur domestic uranium production. Many members of the Spokane Tribe worked at the mine and a mill site in Ford, Stevens County. Mining ceased at the site in 1981, when uranium prices collapsed. The mine cleanup will include filling two deep, open pits with waste rock and providing a cover that will prevent radon gas from escaping, said Elly Hale, an EPA project manager. The caps also will prevent rain and melted snow from filtering through the radioactive waste rock, reducing the water treatment needed at the site, she said. Another focus of the cleanup will be lowering the volume of groundwater that flows through contaminated material and eventually ends up in the Spokane River, Hale said. However, some level of perpetual water treatment will be required at the mine, she said. At the end of the cleanup, an 8-foot fence around the Midnite Mine site will be taken down. Hale said radiation exposure from being on the site should be no different from low, natural background levels found elsewhere on the reservation. If the cleanup work exceeds the $193 million estimate, Newmont and Dawn will be required to pay the additional costs. The companies are required to post $151 million in performance bonds to ensure the cleanup would continue even if they defaulted on the work. Deb Abrahamson, founder of the SHAWL Society, is a tribal activist who has spent years advocating for the Midnite Mine cleanup. Securing money for the cleanup is a major milestone, she said recently: "The company is owning their mess." Ensuring the work is done properly, in a way that protects the cleanup workers' health and creates a site that's safe for people and wildlife, is the next priority, she said. Many of the tribal members who worked at the Midnite Mine and mill site in its early years didn't have proper safety equipment or training, which exposed them to heavy metals and radiation, she said. With unemployment at 55 percent for tribal members living on the reservation, people are eager for the cleanup jobs. This time around, workers should know the risks and how to protect themselves, she said. "How the cleanup will occur is important," Abrahamson said. Or, "we're going to have another generation facing occupational exposure to toxins."